"Struggling to Attract New Customers? 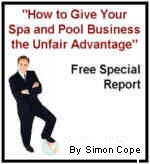 Learn How to Make Your Spa and Pool Business Grow and Prosper"
"Improve Your Pool and Spa Marketing"
Click here to read why Simon Cope can help YOUR business succeed. "Join other spa and pool business owners throughout NZ & Australia and receive "The Six Deadly Small Business Marketing Mistakes" Special Report for FREE. Have Your Spa and Pool Sales Slowed Down? Are You Struggling to Get the Attention of New Prospects and Convert them to Customers? Getting the attention of potential prospects? Persuading your prospects to contact you or visit your store? Turning potential prospects into paying customers? Motivating your prospects to give you more referrals? Spa and Pool Marketing Secrets provides you with information, ideas, and inspiration to help you market your spa and pool business more successfully. Whether you want just a few good marketing strategies or a comprehensive marketing system, you'll find on this website. New Marketing Book "33 Out-Of-The-Box Marketing Strategies"
Comprehensive Marketing System "Recession-Proof Your Spa and Pool Business"
"Here Are What A Few of Our Visitors Are Saying..."
I would just like to say that I don't know what was more amazing the fact that you took an hour of your day to talk to me live on the information you gave me inside that hour. You provided me with great ideas and insights that will undoubtedly make money for our business. The "Lead Generator" program makes so much sense for a small business like ours. Once again thanks for all your help and keep up the great work. I've read a lot of marketing books and I've read a lot of info by marketers on the net, but you are the most practical, knowledgeable and well rounded marketers I've come across. Thanks for the good work. You're a freak'in genius!" "Looking Forward to the Next Issue"
Just wanted to take a minute to say "Thank you" for the valuable information you have given me in your the "six mistakes" small businesses make. I am just starting out in business for myself and am on a limited budget I felt it very necessary to thank you for this valuable information! "Obvious Vast Knowledge of Marketing"
What a great read! I am always in search of new ideas for marketing and you give up some valuable information on your site pro bono, nice! Just a quick note to thank you for being so liberal with your obvious vast knowledge of marketing. We have many more comments from happy visitors similar to these. We hope you have the same experience during your visit. Come back often because we post new articles and other important information frequently. Now take a moment and read some of our thought-provoking free articles.